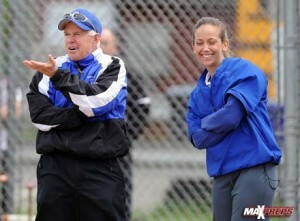 Southington has not missed a beat with Davina Hernandez (right) taking the reigns of the program from legendary coach John Bores (left). MaxPreps photo by Jim Stout. Davina Hernandez chuckled when reminded how many runs her Southington (Conn.) softball team has both scored and allowed this season. The Blue Knights’ run differential has been absurd, as they’ve scored 86 runs and allowed just two. More absurdity — Southington isn’t even halfway through its schedule yet. Also note that the defending CIAC Class LL champions have battered opponents with a new head coach, a new battery, two new outfielders, and with just three seniors on the roster. Southington is 7-0 and ranked No. 1 in the New Haven Register Top 10 poll. The program has won a state-record 15 state titles.